Thermal map of the 61g lava flow, created on December 12, 2017. The thermal map is limited to the current flow (episode 61g flow), which runs along the center of the map. The blue and green colors correspond to lower surface temperatures, areas of cooled, inactive lava. The orange and red colors show areas of hot, active breakouts on the flow surface on December 12. The lava-tube network is shown by white lines, mapped from a sequence of thermal images made over the past year. Steepest-descent paths, shown as blue lines and calculated from a 2013 digital elevation model of the flow field, represent possible flow paths based on topography. Lava erupting from the active vent on the east flank of Pu‘u ‘Ō‘ō has not entered the ocean or reached the Kamokuna lava delta during the past month. 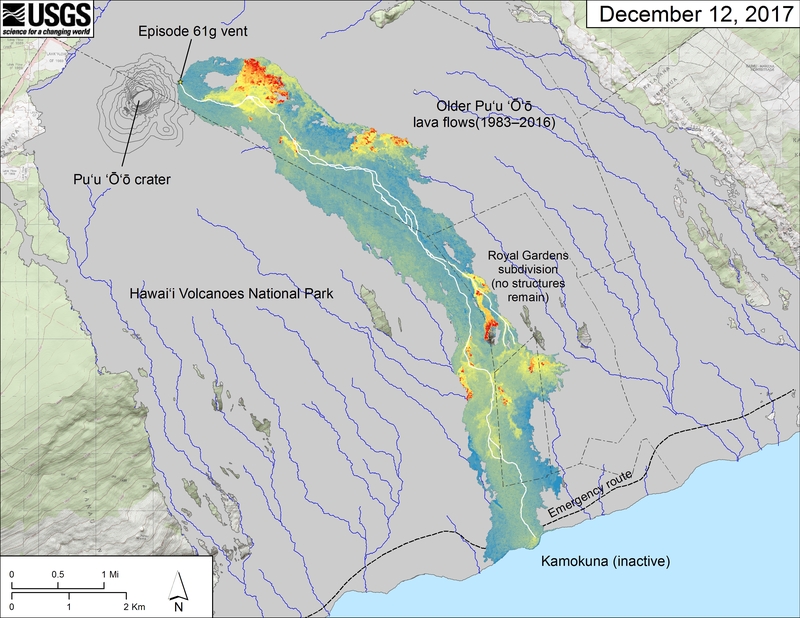 Instead, small lava flows are scattered across the 61g flow field, breaking out from the lava-tube network between Pu‘u ‘Ō‘ō and the coastal plain. Geologists of the Hawaiian Volcano Observatory last observed active lava atop the delta on November 17. For nearly 16 months beginning on July 26, 2016, lava traveled through an evolving lava-tube network into the ocean at Kamokuna. Lava alternately (1) built new land into the ocean when the steep submarine slope grew sufficiently seaward to support a lava delta; and (2) poured directly into the ocean as a great lava fall when the delta and submarine slope collapsed, shearing the tube at the sea cliff and exposing a lava stream 1 to 2 m (3 to 6 ft) in diameter gushing into the ocean. Earlier this year, with commercial boat operators taking people to the lava entry by sea, thousands of people viewing the lava fall from the established viewing area inside Hawai`i Volcanoes National Park or by helicopter, more people probably witnessed this lava fall than any other since lava first reached the ocean in 1986. Why did the lava delta become inactive? Simply, lava stopped reaching the delta either through the tube or as surface flows, slowly at first, and then intermittently. Most likely, a combination of three factors prevented lava from reaching the delta. First, many scattered breakouts from the lava-tube network between Pu‘u ‘Ō‘ō and the delta effectively decreased the amount of lava reaching the coast. A series of breakouts from the upper section of tube this past summer developed into a second tube on the east side of the 61g flow, diverting an increasing volume of lava from the primary (west) tube and ultimately, the delta. For at least the past few weeks, this east tube, which has not yet reached the ocean, appears to be supplying more lava to surface flows than the west tube. Second, starting in mid-November, tiltmeters at the summit of Kīlauea recorded two sharp deflationary trends followed by alternating deflation-inflation episodes. These tilt patterns have corresponded well during the Pu‘u ‘Ō‘ō eruption to a decrease in the supply of magma or an interruption in supply of magma to the erupting vent, respectively. Less lava erupting from the vent results in less lava entering the tube network, further diminishing the volume reaching the coastal plain in either branch of the tube network. Finally, by mid-November one or more restrictions along the west lava tube on the coastal plain blocked the entire underground lava stream from reaching the delta. Several breakouts from the tube within 100 m (300 ft) of the sea cliff had flowed onto the delta or into the ocean in recent months but after November 14, these flows were too small to make it that far. No active flows in this area have occurred since November 22. If the east tube continues to capture more of the lava stream from the west tube and more voluminous breakouts spread eastward, they could eventually travel towards the coast along steepest-descent paths east of the current 61g flow. Stay tuned to the flow’s next move by visiting the HVO website for updated thermal maps, updates, and photographs of the flow field.